Happy May Day! If you have an 8-hour work day – Celebrate! May 1st is observed as International Labor Day by most of the countries of the world. The reason most people believe that May Day is a communist holiday is because corporate America doesn’t want you to even wonder why that day was chosen. It’s because 4 union members were hung in Chicago in 1886 for fighting for the 8-hour day that you take for granted today. If you read this you will know something that probably less that one American in 400 has ever heard about. On May 1, 1886, there were massive strikes all over America. Months before, The Knights of Labor, the largest union of that day, had said that if their members didn’t get the 8-hour day 6-day week by that date they would call for a nation-wide strike. 20,000 workers actually had it so it was not an impossible dream. On that day in Chicago 190,000 people demonstrated for the 8-hour day. There were 340,000 people demonstrating nation-wide. The newspapers were screaming that all unions were communist conspiracies and that the whole idea of an 8-hour day was a foreign conspiracy and an attack on the sanctity of the home. They wrote that it would lead to the degeneration of family life, debauchery, lower wages, increased poverty and social degradation for the American worker. The workers were unimpressed by such warnings. The press was constantly recommending unlawful violence against any and all strikers. Their solution was to deport the “foreign scum” and take care of the homegrown types with the liberal use of the noose and gattling guns. While newspapers were always calling for “Law and Order” they were often the first to call for citizens to break the law by encouraging them to take the law into their own hands. An editorial in the Chicago Tribune Nov. 23 1875 said. “…There is no people so prone as the American to take the law into their own hands. Judge Lynch is an American by birth and character. … Every lamp-post in Chicago will be decorated with a communistic carcass if necessary to prevent wholesale incendiarism or prevent any attempt at it”. As the May 1st deadline approached the Chicago newspapers were screaming for a communist carcass for every lamppost. They concentrated their fire on Albert Parsons and August Spies, two of the most prominent people in the Chicago area responsible for workers demanding the 8-hour day. Most officials of the force as well as patrolmen were actually drawing pay from the corporations as well as from the city. They believed that every striker was a foreign born communist plotting the overthrow of the established order . . .. During the two months before May 1, the employers, who actually controlled the local government, made their plans. They mobilized the National Guard, deputized special police and increased the number of people in the Pinkerton Detective Agency. The Pinkerton Agency was notorious for its use of illegal force in breaking strikes. It had killed dozens of workers during previous strikes but had never been convicted. On May 1st, as a parade started, on side streets and rooftops police, Pinkerton’s militia and special police were stationed with rifles and other instruments of war. There were 1350 members of the National Guard armed with Gatling guns, ready to march on a moment’s notice. A committee of prominent citizens was assembled; all were prepared to save Chicago from the communistic 8-hour day. The parade ended without any mishaps. While the police would have liked to become involved they couldn’t find an excuse to interfere. The strike spread the following Monday and several thousand Chicago workers, as well as many others across the country, were granted the 8-hour day. The citizens committee demanded that something be done. The police relieved a little of their frustration by clubbing some of the locked out workers from the McCormick Harvester works as they escorted in 300 scabs. At the end of the shift there was a great crowd of the locked out workers at the plant gates waiting for the scabs to come out. Suddenly, and without warning, the police charged the crowd with drawn pistols. As the crowd fled, the police opened fire. Six were killed outright and many others were wounded. The fact that every one of them was shot in the back as they ran away rules out any argument that the police were under attack. Later that day a decision was made to hold a meeting the following night at Haymarket Square to protest the police brutality. The weather was cold and the crowd was too small for Haymarket Square. August Spies had pushed a wagon onto a corner of the cobblestone street a half block away to use as a speaker’s platform. Nearby was the Desplaines police station, under the command of Captain John “Clubber” Bonfield. Unknown to Spies there were 180 armed police there, ready to march on the meeting if the occasion arose. Also unknown to him was the fact that the Mayor, Carter Harrison, was in the crowd. Spies was speaking when he saw Parsons arrive. When the crowd saw him they applauded. Parsons climbed up on the improvised podium and said “I’m not here for the purpose of inciting anybody but to speak out and tell the facts as they exist.” The Mayor slipped out of the crowd and went to the police station. He told Captain Bonfield that the meeting was peaceful and that he could send the police back to their regular duty. Parsons finished speaking at ten o’clock. It was starting to sprinkle and many of the people left. Parsons, along with his wife, two children, and some others, went to a friendly tavern on a nearby corner known as Zepf’s. There they were laughing and discussing the strike while Fielden plowed on before a dwindling crowd. There was a moment of silence. Then there was a flash of red and a terrific explosion. A bomb had gone off amongst the police. There was terrible confusion in the darkness. The police were firing wildly in every direction, people were running, many were wounded and later died. Others were being trampled upon. The police were clubbing right and left. One policeman had been killed and seven others were wounded. The next day the newspapers of the nation called for vengeance. They blamed the strikers for throwing the bomb though to this day no one knows who threw it. There has been speculation that it was actually a police bomb that they intended to throw that accidentally went off. The national press was unanimous in declaring that it made no difference whether Parsons, Spies, or Fielden had actually thrown the bomb. They should be hanged for their political views and for their words and general activities and if more troublemakers were given to the hangman so much the better. Typical of the type of imagination that was displayed by some of the newspapers was that of the New York Tribune which reported: ” . . . The mob appeared crazed with a frantic desire for blood and holding it’s ground, poured volley after volley into the midst of the officers.” With that type of misinformation being fed to the public it’s little wonder that most people turned against the workers. Within a few days Parsons along with Spies, Fielden, Michael Schwab, George Engel, Adolf Fischer, Louis Lingg, and Oscar Neebe were indicted for the murder of Mathias Deagan, the patrolman who was killed by the bomb. It was obvious that none of those indicted actually threw the bomb because only Spies and Fielden were at the scene when the bomb went off, and Fielden was talking to Captain Ward when the bomb went off. The prosecution never contended that any of the defendants had plotted with others to throw the bomb. The prosecutor claimed that it was because of what they had said and written that caused some unnamed person to throw the bomb. The reign of terror soon spread to other cities. Labor was its main target. The entire executive board of the Knights of Labor was arrested in Milwaukee and charged with rioting and conspiracy. In New York, the entire executive board of District 75 was arrested and charged with conspiracy while directing the strike against the Third Avenue Elevated. Four union officers in Pittsburgh were arrested and charged with conspiracy. Parsons went into hiding in another state but voluntarily returned to stand trial with his friends, even though he told friends that he was sure he would be hanged. Parsons knew what Governor John P. Altgeld of Illinois, seven years later formally found to be a fact. That a stacked jury would try them, and perjured testimony would be used before a judge who was bent on seeing them hang. These witnesses, some of them bribed and all of them terrified, swore that the defendants were part of a plot to overthrow the government by force and violence and that the Haymarket bomb and Degan’s death was just the first blow in what was to be a general assault on all established order. The problem was that under cross-examination it became clear that their testimony was filled with obvious errors and contradictions. Therefore the prosecutor had to shift gears and abandon that approach in the middle of the case. All of the national press was represented. The public received thousands of words concerning the proceedings. Armed guards surrounded the courthouse, a theatrical move that was explained to the public by saying it was expected that at any moment the anarchist army would attempt a rescue. The verdict was a forgone conclusion from the beginning. All were found guilty. All were condemned to be hung except Neebe who was given fifteen years. He addressed the court and asked that he also be condemned to death, as he was no more innocent than the rest. At that point most people thought it was all over except the hanging. While their case was being fruitlessly appealed to the Illinois and U.S. Supreme Court, Parson’s wife, Lucy, with their two children in tow, set out on a one-woman crusade. She started a grassroots protest movement that grew to millions worldwide. The U.S. Supreme court refused to hear the case. If they had heard it they were almost certain to have set the verdict aside. All around the world there were protest demonstrations against the convictions. In France the Chamber of Deputies asked the governor to set the verdict aside. There were very large mass protest meetings in Italy, France, Russia, Spain, Holland and England where George Bernard Shaw and William Morris worked to save the condemned men’s lives. The day before the executions were to take place, Governor Oglesby commuted the sentences of Fielden and Schwab to life imprisonment. On the same day, Lingg who was only 22 and couldn’t speak English, was described as not having a friend in the world outside of his native Germany. He either committed suicide or was murdered in his cell. On the day of the execution, Mrs. Parsons and her two children were franticly trying to get access to the jail to see their husband and father for a last time. She was arrested and along with her children was thrown into a cell. The four men were led to the gallows. They stood tall and proud. Most reporters said they seemed to stand taller than usual. As a mask was pulled down over the face of August Spies he said, “There will come a time when our silence will be more powerful than the voices you strangle today.” Fischer said, “This is the happiest day of my life.” Parsons asked if he would be allowed to speak. He said, “Let the voice of the people be heard!” Before he could continue the trap was sprung. Seven years after the four men were hanged John P. Altgeld was elected governor of Illinois. He had been petitioned by labor and many liberals to release the men held in prison. He went over the record. He said that the four men had been legally lynched and that the three survivors were being imprisoned not for their actions but for their beliefs. Even though he knew that it would be the end of his political career, he pardoned them. It caused a firestorm in the press. His decision was condemned as the ravings of a mad man by the press of his day. He fought on against child labor, anti-union injunctions, and the rights of immigrants and workers. The abuse of the press continued for the rest of his life but historians today say that his decision was a state paper of the first rank. In 1889 labor leaders from many countries met in Paris. They voted to continue the action for shorter hours for all workers of the world and that May 1st would be designated as International Workers Day. On that day in 1890 workers all over Europe showed their solidarity with the workers of America by taking part in parades, meetings and demonstrations in support of their struggle for the 8-hour workday. That was the first May Day celebration. The use of the frame-up was very widely used in those days. It could have very well been the case here. It set our fight for the 8-hour day back by many years. Most of those who had won the 8-hour day as a result of this action later had it taken away. The U.S. uses a different Labor Day because it doesn’t want people to be reminded of what occurred in this case. It was a successful move because practically no Americans know why International Labor Day is held on May first. That is just one very tiny bit of our ugly labor history that is very deliberately hidden from the American public. Ken Secor is a member of Activist San Diego and the International Association of Machinists (Retired). geez all that name calling against the labor movement reminds me of…oh, yeah, it’s the GOP guys who are now screaming “socialist!”…. What a shame that humans rebelled against the big business people. Don’t they know that profit is the most important thing to any business. Child labor, sweat shops, locking the women to their sewing machines, unions demanding better conditions and pay, these are all things that cut into profit. Of course the greatest profit worker plan was called slavery. Many Americans died trying to make working conditions better. Of course just like with the politicians, the union bosses became greedy, which hurt the little guy. Republicans have been trying for years to kill the unions. The solution of course is honest leadership for all, which is as always only a dream. Thanks Ken for your detailed history, a history that is ours but we don’t know it. It is not taught in school, and it’s been lost in terms of any oral history passed on from one generation to the next. I recall that President Richard Nixon had May first declared “Law Day” – anyone remember that? Another piece of our “lost history” is what happened in 1877. A railroad strike in eastcoast cities turned into a national conflagration over labor rights and basic political rights. Entire cities were torn apart, as masses of demonstrating workers and their families were fired upon by government troops. Many militias went over to the side of the protesters – which by the way – led to the development of a National Guard – an armed force that would not be sympathetic to the locals. 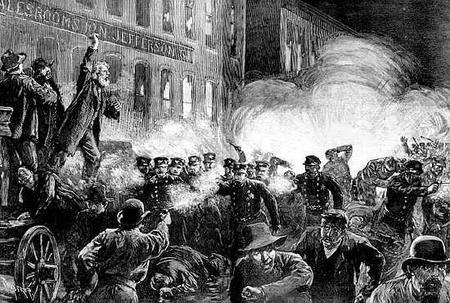 What happened in 1877 was so devastating that it has been entirely covered up – even more so than the real story behind May Day. Check it out – and then tell your children and your parents. It’s all warm & fuzzy to believe that this “the land of the free” is free from controversy, and while I love this great country and am so thankful to have been born here, we’re not without our skeletons. The end of slavery must have frightened the hell out of the power bosses, so any way they could keep their bottom line intact was probably considered fair. They justified it in their own warped beliefs, even to go so far as to inflict death to those with any opposing viewpoints. I see great similarities between what happened in Chicago, and how Republicans treated U.S. citizens who were opposed the war in Iraq, by calling us un-patriotic. Granted, I wasn’t hanged for my beliefs that a war in Iraq was wrong on every level, but that’s because of people like Albert Parsons, August Spies, Samuel Fielden, Michael Schwab, George Engel, Adolf Fischer, Louis Lingg, and Oscar Neebe who came before us and fought for fairness. By August 29, battle was fully joined. Chafin’s men, though outnumbered, had the advantage of higher positions and better weaponry. Private planes were hired to drop homemade bombs on the miners. A combination of gas and explosive bombs left over from the fighting in World War I were dropped in several locations near the towns of Jeffery, Sharples and Blair. At least one did not explode and was recovered by the miners; it was used months later to great effect during treason and murder trials following the battle. On orders from the famous General Billy Mitchell, Army bombers from Maryland were also used for aerial surveillance, a rare example of air power being used by the federal government against US citizens. One Martin bomber crashed on the return flight, killing the three members of the crew.